Buffet, Plate, Box or Food Truck Style! We care as much, if not more, about your guests loving our food. It’s the big day and the last thing you want to hear is grumbling about the food which is why we feel confident we can offer you what you really want — guests raving about how great their meal is! Catering is available for parties of 10 or more. We can do a buffet, plated, or box catering. Our food truck can go to any event. Fabulous food at a fabulous price. TOB is always a hit at our events, and they can accomodate various food needs like gluten-free, vegetarian, as well as religious dietary restrictions. 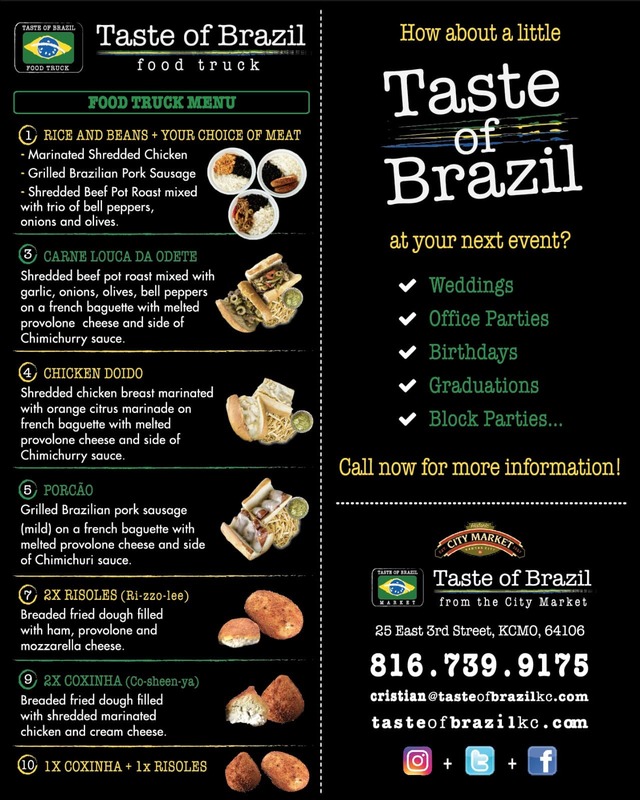 I’ve used Taste of Brazil for several business lunch caterings and it has always been a great experience. The food is unique and delicious, the staff is always very accomodating with their different options and even delivered to Lawrence for me on one occasion! I highly reocmmend TOB Market to anyone who wants to make a lasting impression on their customers. At the event that I attended Taste of Brazil catered and they were there from the very beginning, preparing the food. The staff was very friendly, you can really tell that this is their passion. And the food was SO GOOD!! I couldn’t get enough. I would definitely recommend them to anyone in need of catering. FANTASTIC food!! Friendliest staff in the market! They are very friendly and happy people enjoying serving this fabulous Brazilian dishes. Teh owners have years of experiences in the Kansas City restaurant industry managing upscale restaurants in the area. It is a good mix of American work quality and professionalism with Brazilian values. The food is amazing! The employees at Taste of Brazil are friendly, helpful and great people. If you want quality food at a great price, TOB is the way to go!! AND INVITE US TO YOUR PARTY! We can do buffet style, plated, or container meals or bring our food truck to you. Download our catering brochure or food truck menu! If you are having trouble knowing what to order for your catering, just shoot us an email or give us a call and we can help you choose the perfect food for your event. Have a question, book the truck, or ready to submit your catering form? I love you, keep me updated with your newsletter!